"Is a Worry Worrying You?" This critically acclaimed title addresses common childhood worries--a bully, a first day at school, and a monster residing under the bed--with the not-so-common worries--an eagle making a nest in your hair, a rhino walking down the street, and a herd of elephants waiting for their tea. This entertaining and humor use of perspective and creative problem-solving will appeal to children and parents looking for help in dealing with a universal issue. Suppose, just suppose, one hundred elephants come to tea and you discover you don't have any tea bags. Uh, oh. What will you do with a herd of thirsty elephants? Now that's a worry! But you can get rid of that worry by offering the elephants lemonade instead. Adults think of childhood as a carefree time, but the truth is that children worry, and worry a lot, especially in our highly pressurized era. This book addresses children's worries with humor and imagination, as hilarious scenarios teach kids the use of perspective and the art of creative problem-solving. This book would be perfect for any classroom, counselor, teacher or family. 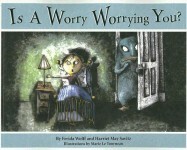 Every child worries, and this book brings it down to the level of a child so that they understand what a worry is, what do when you have a worry and why its okay to worry. I would recommend this book for any age, and would really encourage adults to read this with their little ones..it will put their worries (and maybe some of yours) at ease. Thank You so much Net Galley and Tanglewood Press for allowing me to read this book! I cannot wait to read more books from you in the future!